Two-goal Josh Moreman (blue) in action for Peterborough Sports against Kidlington. Photo: James Richardson. Peterborough Sports and Stamford AFC are both sitting proudly on top of their Evo Stik League tables. Sports eased to a 4-0 home win over bottom club Kidlington to stay in pole position on goal difference from Thame United who beat Yaxley 2-1 yesterday (September 1). The top two boast the only 100 per cent records in Division One Central of the Southern League after four matches. Handball in the penalty area by a Kidlington defender during their 4-0 defeat at Peterborough Sports. Photo: James Richardson. Stamford lost their 100 per cent record in a thrilling contest at home to Cleethorpes. It finished 4-4 after The Daniels had led 3-1 and 4-2. But Stamford still lead the Northern League Division One East table by a point from Northern challengers Morpeth and Marske who yesterday beat Wisbech (5-2) and Spalding United (2-0) respectively. It was plain sailing for Sports against a team who lost their opening game 11-0 once Lewis Hilliard had opened the scoring from the penalty spot in 13 minutes. Josh Moreman made it 2-0 before the break before Avelino Vieira and Moreman scored in the final 13 minutes after the visitors had seen a man sent off in front of a crowd of 112. Moreman and Vieira answered manager Jimmy Dean’s call for his forwards to start scoring. Yaxley have lost three in a row after winning on opening day. They conceded twice in the first seven minutes at Thame before Tom Waumsely pulled a goal back 17 minutes from time. It was a cracking contest at the Zeeco in front of a crowd of 289. They saw two red cards as well as eight goals. Josh McCammon makes a tackle for Peterborough Sports in their Evo Stik League win over Kidlington. Photo: James Richardson. Jordan Cooke, Joe Burgess, who was later stretchered off with a head injury, and an own goal saw Stamford 3-1 up at the break and a Bradley Fortnam-Tomlinson strike 20 minutes from time which made it 4-2 looked to have sealed the points. Cleethorpes pulled a goal back quickly and then Stamford’s Rob Morgan was sent off before the visitors equalised on 86 minutes from the penalty spot. Cleethorpes had a man sent off in injury time. 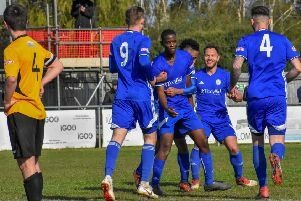 Spalding’s run of three draws was ended by a strong Markse side, while Wisbech returned pointless from their 450-mile round trip to Morpeth despite taking the lead through Leyton Maddison. The hosts equalised on the stroke of half-time before running away with it after the break. Danny Setchell claimed a late consolation goal for Spalding. Northern League East: Morpeth Town 5, Wisbech Town 2 (Maddison, Setchell); Spalding United 0, Marske United 2; Stamford AFC 4 (Cooke, Burgess, Fortnam-Tomlinson, og), Cleethorpes 4. Southern League Central: Peterborough Sports 4 (Moreman 2, Hilliard, Vieira), Kidlington 0; Thame United 2, Yaxley 1 (Waumsley).